[Via Satellite 03-09-2015] Arianespace won a launch contract from SES to orbit the recently announced all-electric satellite SES 15. 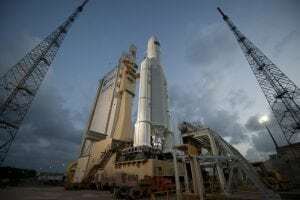 Under construction by Boeing on the company’s Boeing 702SP bus, the satellite is scheduled to launch during the second quarter of 2017 aboard an Ariane 5 rocket. Once operational at the new orbital location of 129 degrees west, SES 15 will provide services for government, aviation and maritime customers using Ku-band wide beams and high throughput Ku- and Ka-band beams in North America. The contract, Arianespace’s 41st with SES, is also its second with the company for an all-electric satellite. The first, SES 12, is expected to launch in the fourth quarter of 2017 on another Ariane 5. The post SES Opts for Ariane 5 to Launch All Electric SES 15 Satellite appeared first on Via Satellite.